Flies swarmed around her eyes. She was a frail, wrinkled woman, in her forties I guessed, but looking much older. Her face was dark brown, with tiny brown eyes to match. She never once swatted the flies away. She sat in the sand beneath a date palm tree that offered a thin veil of shade. She wore a tan cloth wrapped around her head. The strands of gray hair that had slipped out from under it were stuck to her forehead with sweat. Her dress was also tan. It had no doubt once been dark brown but had faded with time. She wore tattered black sandals, too small for her feet, that left two toes sticking out of the ends. She was playing with a piece of dry reed, and her eyes kept shifting from it to us. She looked at us curiously, but privately, not wanting to be noticed, but to notice. After a few minutes, she rose and came close – bringing with her an unknown language and an as yet unknown request. She wanted medicine for her eyes. We carried with us ointment along with remedies for other maladies that afflict the uninformed. Not that we were angels of mercy, but more that we knew of no other commodity that our 65mph world possessed that could be so easily appreciated and accepted. Shaka squeezed the ‘by prescription only’ potion into the corners of the woman's eyes. She seemed satisfied that the western woman had worked her wonder. Eventually she wandered over to sit beneath a stunted palm, scooped some dates from the sand, and munched them as she waited for her miracle to commence. 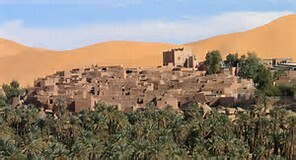 We had arrived at the oasis of Taghit – a minute island of date palms on the edge of the Algerian Sahara. Last night we crossed the border. The guards kept us there for four hours, searching our belongings in hopes of finding anything that would justify the payment of a bribe. Mostly they looked for money, but drugs would also serve their purpose. It was forbidden to bring in the currency of their country, which could be obtained cheaply in Morocco. They claimed their Algerian money had great value – the rest of the world accepted about sixty percent of their claim. Just before the border, I had stashed some hashish in a toy magic trick. The hash was for us; the trick was to entertain the local kids – another of our premeditated attempts to communicate rather than alienate. The toy was a wooden tube with a clown's head on one end. When you twisted and folded it in half, it turned into a six-inch bunch of flowers. Silly, yes, but it has always served its purpose in helping me draw in someone or someones. About three and a half hours into the search, one of the guards found the tube and was trying to figure out what it was. I took action. I said, "Regardez," took it out of his hand, and commenced playing magician, hoping that I could entertain him for a minute and he would go onto something else. I tucked the trick under my arm, rubbed my hands together and blew on them, like with dice at the craps table. A few of the guards laughed at my antics. I took the trick in one hand, extended my arm, and held it up for the audience to see. I brought it down to waist level and, with a few waves of my hands, swiftly turned it into a bouquet. I handed it with a bow to Camas, who smiled, took it, and curtsied. It worked. We were allowed to repack and go on our way. That night we slept in no-man's land – the two hundred yards between the end of Morocco and the beginning of Algeria. In the morning we walked southeast – a direction that revealed a post-revolution vista primed with barbwire, cement barricades, and spent shell casings — remnants of the struggle with French colonials decades earlier. We hoped to supply ourselves with the necessities for our venture into the interior in the village of Beni Ounif, first in our path. Unfortunately, their stores were stands, and their stands held only a few cans of peas and jars of apricot jam. We stocked up. This, and our freeze-dried would have to fill not only our stomachs, but the many idle hours to come in which our relatively affluent lives had accustomed us to applying the food-for-boredom solution. The onslaught of warnings from the locals about the desert had subsided when Shaka's eye patient, speaking on our behalf, had uttered the magic word – Americans – which immediately puts the individuals referred to in a separate category. Whether that category be magician, idiot, superhuman, or superfool I have no idea, but it usually has some profound effect. 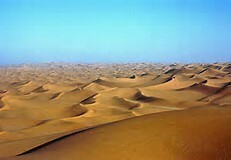 Taghit's finest have agreed to supply a camel caravan that will take us out into the depths of the Grand Erg Occidental — the portion of the Sahara Desert that most resembles an ocean — and come back for our remains, as they put it, in one week. Payment has, of course, to be made in advance. No explanation was forthcoming and none was needed. Tomorrow morning we are to meet them at the edge. We arrived at dawn. After the appropriate greetings, we loaded our gear, food, and water onto the camels, then turned our backs on the oasis and headed out to sea. I think we were all slightly apprehensive, not only about being dropped off in the middle of nowhere for a week, but about being stuck with ourselves and only ourselves for that length of time. The heat of the day can only find competition from the glare of the sun on the sand. This fine sand, which appears a soothing salmon color in the evening, is far too bright a white even to look at by day. Our canopies protect us from the rays, as the shadows cast by the edges of the nylon become barriers not to be crossed, much as it is with their sisters between the dark and light sides of the moon. When we aren't reading, we pass the time by swatting flies or competing with the survivors for our meals. By some instinct that I cannot fathom, flies had traversed miles of sand to find us. I don't think flies are ordinarily in the desert. What would they eat? With our arrival however, their silent trumpets had sounded and alerted all their relatives. We had anticipated encountering flies sometime on our journey, so thankfully we each had with us a jungle-type hat with netting that hung around the circumference of our heads. We wore these pretty much all day long and got so used to looking through the screen that I often forgot I had it on. Earlier today I got a little piece of something hard in my mouth and without thinking, quickly and forcefully spit it out, only to find it stuck in the netting draped before my face like a tennis ball in a cyclone fence. I turned to see if anyone had witnessed my moment of stupidity and saw one of my companions laughing so hard that no sound was coming out of her mouth. To see her laugh so genuinely and spontaneously made my embarrassment worth it. In the evenings we are liberated – the sand cools with the passing of the sun and we venture out to explore this remarkable environment. We've placed a red cloth banner on a stick at the highest point of the loftiest dune in the area as a lighthouse to guide those of us back to camp who've wandered out into the repeating theme of the desert – dune after dune, waves of sand as far as one can see. When one steps out from underneath the canopy to look around, it is a bit overwhelming – the silence, the beauty, the sand, and the sky. When the sun is completely gone, the sky becomes sprinkled with stars. More and more appear, like I've never seen before. There is no pollution, and no lights mute this show in any way. It's as if all those who had ever lived and will live were staring down at us in all their permanence. This evening we all wandered out, each in one of the four directions. I walked only a few hundred yards away and sat atop a mound of cool pink sugar. Knees bent and eyes open, I looked out at the vista. As far as I could see there was just mile after mile of desert. There was a quieting sense of solitude, of being totally and absolutely alone that was quite profound. Aside from my breath going in and out, I heard no other sound, just an amazing silence. It made me think of the color white – how supposedly it is made up of all the colors. So too was the silence – as if it contained all sound. In moments it was almost deafening. 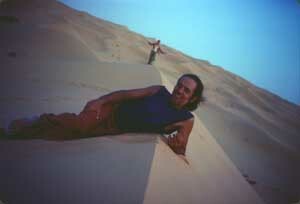 In this great expanse and under the vast sky I felt very small, just like the grains I was sitting on. I stretched out my legs and played in the sand with my bare feet. I dug down into the warmth and softness. I lifted one foot up and watched the grains fall off to the pink sea below, like millions of passengers jumping overboard from a sinking ship. Sometimes a triangular ridge of sand would be left, like a tiny replica of Mount Naceur. I would shake it off and begin again. I spent the next blissful hour skimming the peaks of wind-sharpened ridges of fine sand with my toes. That I am able to spend time like this is certainly evidence that the intricate forms of entertainment to which I normally gravitate have gone a little too far. As I sat there sculpting, I pondered the decrease in my level of neediness. I wondered if perhaps in my future some of the simple pleasures that have fallen by the way might be resuscitated.